St. Paul, Minn. — Surveys show that men account for more than two out of three of this country's bicycle riders. Organizers of Bike Walk Week want to chip away at the imbalance. There are several events today in the Twin Cities encouraging women to bike and walk to work. Part of the equation for some cyclists -- women or men -- is figuring out how to deal with the glow one acquires while pedaling. Two weeks ago Rachel Bents went carless. Bents, a St. Paul consultant, works at home but has to attend meetings where on occasion business dress is appropriate. Bents says her recent decision to get rid of her car and rely more on her bike for commuting raises the perennial perspiration question. "How do I go to work, how am I presentable at a meeting? How do I go on a date even?" she said. "How do I do some of those things where traditionally it's not appropriate to be all sweaty?" The answer is go slow. Don't work too hard. This is confirmed by Mary Hansel Parlin who's been commuting by bike to work for 15 years. Parlin is a high school teacher in Winona. Besides allowing plenty of time for the trip her other perspiration reducing solution is to plan a route of least resistance. "I also took a couple of practice runs," Parlin said. "You don't want to have it be your first day at work and you come in too sweaty or exhausted or late." 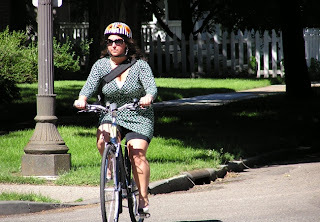 After perspiration another big issue raised by biking to work is fashion, what to wear. 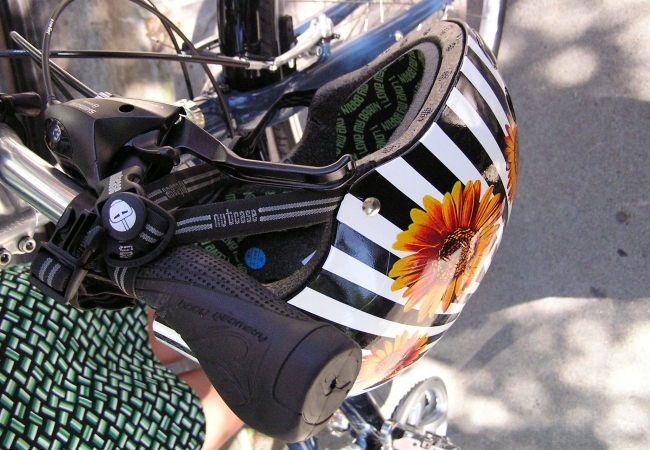 Mary Hansel Parlin remembers learning an important bike commuting fashion tip early on. "When my long skirt got caught in my chain and I wiped out on my way to school that was the last time I was foolish enough to wear a skirt, so I just have to bring extra clothes along," she said. As a challenge to the bike commuting fashion gods, Rachel Bents shows up for our radio interview dressed for success just to show it can be done. "I've got a dress on today, I actually wore heels today. I don't always wear heels when I'm biking," she said. "I feel like, 'OK, I can do this. Women in Europe do it all the time.'" And it's true. Rachel directs me to the Copenhagen cycle chic website filled with photos of women in Denmark dressed to the nines riding their bikes. A growing number of employers are warming to the idea of biking and walking to work. Every year during Bike Walk Week in Duluth, Carol Andrews' employer, Barr Engineering, stages a friendly competition. Employees win points if they ditch their car and bike or walk instead. "We had a gal up in Hibbing who said, 'Well, I'd like to do that but I live 30 miles away,' and I said what if you drove 15 miles and then biked the last 15 on the Mesabi Trail and she started doing that a couple days a week.," Andrews said. And that brings us to a central point raised by Bike Walk Week. Besides tips for combating perspiration and selecting the right apparel the annual event brings up the question of deciding where we live. Carol Andrews says she and her husband selected a place to live that allows them to walk or bike to their jobs. Same for Mary Hansel Parlin in Winona. "I think one of things that our family decided when we bought a house is where is everything and could we possibly bike or walk there," she said. One of the most far reaching questions posed by Bike Walk Week is: What would America look like, how would cities and suburbs change, if more people made similar choices?